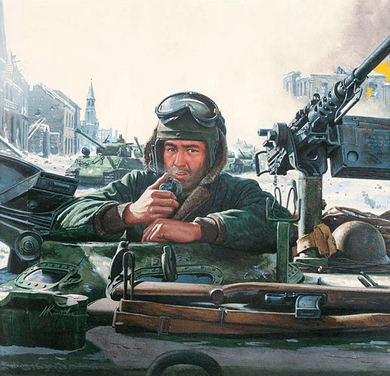 Mort Kunstler Handsigned and Numbered Limited Edition Giclee on Canvas:"Tank Commander - Battle of the Bulge"
About the Art: The Battle of the Bulge, fought from December 16 to 26, 1944, became one of the most heroic episodes in American military history. On the 17th, the 101st Airborne, then on rest leave in Paris, drove all night with headlights blazing and reached Bastogne the next morning in time to save the little garrison from disaster. Then followed one of the fiercest battles of the war.